The origin of rural poverty is complex and multidimensional. Some aspects of this origin include culture, climate, gender, markets, and public policy. Similarly, the rural poor population is quite diverse both in the problems they face and the possible solutions to those problems. 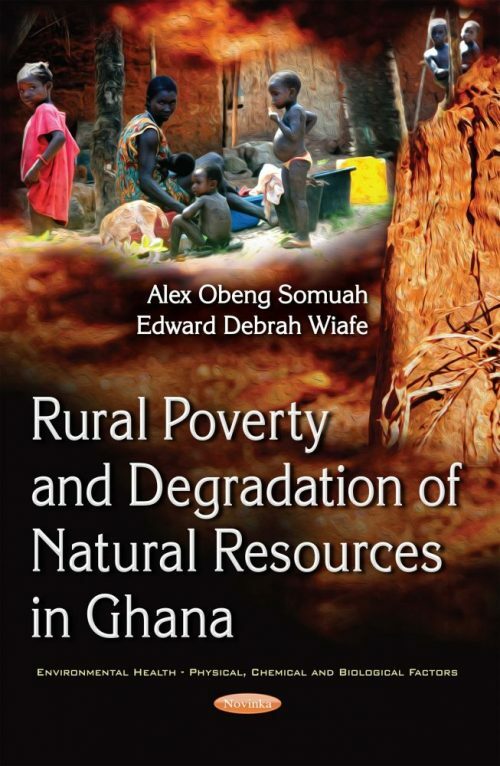 This book examines nature and characteristics of rural poverty and how it develops, its persistence, and how it has caused destruction to environmental resources. The quest for global stability and peace has placed poverty issues at the centre of deliberation. In the year 2000, the eight Millennium Development Goals (MDGs) directly addressed the problem of poverty and its alleviation. Natural resources degradation is usually understood in terms of over use of scarce non-renewable and potentially renewable resources. It entails damage or destruction of key natural resources—such as soils and forests—and the subsequent production of wastes. Low-income rural dwellers have much lower levels of consumption than middle and upper income groups, but occupy much more land per person than middle and upper income groups. Yet, low income groups consume less food and generally have diets that are less energy and land intensive than higher income groups. However, low income populations deplete natural resources for settlements, farming and extraction of resources for many urban dwellers. Kanwer, J.S. 1982. Managing Soil Resources to meet the Challenges of Mankind. Presidential Address, 12th International Congress of Soil Science, New Delhi. Food and Agriculture Organisation 2000. Land resource potential and constraints at regional and country levels. World Soil Resources Reports 90. World Resources Institute 1990. Tropical Forests. The World Bank and the United Nations Development Programme, Washington, D.C.: WRI. UNEP 2001. An Assessment of the Status of the World’s Remaining Closed Forests. UNEP/ DEWA/TR 01-2. Division of Early Warning and Assessment (DEWA) United Nations Environment Programme (UNEP) P.O. Box 30552, Nairobi, Kenya. Reid, W. V., & Miller, K. R. 1989. Keeping Options Alive: The Scientific Basis for Conserving Biodiversity. Washington, DC: World Resources Institute. Food and Agriculture Organisation 2001. Poverty, Food Security, and Agricultural Biotechnology: Challenges and Opportunities. Report of the food and agriculture organization of the United Nations, FAO. United Nations Educational, Scientific, and Cultural Organization (UNESCO). 2007. Education for all global monitoring report: Reaching the marginalized. Paris: UNESCO. Serageldin, I. 1992. Governance and the Development Process. Finance and Development, 28 (3), 13–24. Mayers, James. "Trees, Poverty and Targets:Forests and the Millennium Development Goals." IIED, 2007. Newman, L. 1998. Qualitative-quantitative research methodology exploring the interactive continuum. Southern Illinois: Carbondale, IL (pp. 61-74), Washington, DC: Island Press. Green, C. P. A. 1992. The environment and population growth decade for Action. Population Reports Series M, No. 10. Population Information Programme, Baltimore, USA: John Hopkins University. Tolba, M. K. 1993. The Earth Summit and Africa’s Development. Ibadan, Nigeria: IITA. Food and Agriculture Organization 2007. Land use systems of the World www.fao.org. Accessed 15 June 2008. Lele, U. and S.V. Stone. 1989. Population pressure, the environment and agricultural intensification, variations on the Boserup hypothesis. Managing Agricultural Development in Africa (MADIA) Discussion Paper. The World Bank, Washington DC, USA. Boserup, E. 1981. Population and Technological Change. Oxford, United Kingdom: Blackwell. 170-230. Ruthenberg, H. 1980. Farming Systems in the Tropics. 3rd ed., Oxford: Clarendon Press. Atongi, A. 1998. Population, poverty and environmental degradation in the Bawku East District, Unpublished Master of Arts dissertation. University of Cape Coast, Cape Coast. Morvaridi, B. 1994. Management of water supply and sanitation projects in Maharashtra State, India. Journal of International Development, 6, 129–132. Schnaiberg, A. 1980. The environment: From surplus to scarcity. New York: Oxford. Durning, A. B. 1990. Actions at the grassroots: Fighting poverty and environmental decline. World watch paper 88, World watch Institute, Washington D.C.
	Stonich, S. C. 1989. Land degradation and society. London: Methuen. Food and Agriculture Organization 2006. Global forest resources assessment. Forestry paper 147 FAO, Rome. Nsiah-Gyabaah, K. 1994. Environmental degradation and desertification in Ghana. England: Avebury Ashgate Publishing Ltd.
	Ministry of Lands and Natural Resources. 2011. Revised forest and wildlife policy of Ghana. Pp 1-38. World Bank. 2008. High-level Event on the Millennium Development Goals. New York: United Nations Headquarters. United Nations Development Programme 2001. GLOBIO. Global Methodology for Mapping Human Impacts on the Biosphere. UNEP/GRID-Arendal. UNDP 2000. Human Development Report 1990. New York: Oxford University Press. UN Millennium Project, 2005. Investing in development: A practical plan to achieve the Millennium Development Goals. Report to the UN Secretary General. International Fund for Agricultural Development, 2001. Rural Poverty Report: The Challenge of Ending Rural Poverty. Oxford University Press. Abdulhadi, R., Kartawinata, K. & Sukardjo, S. 1981. Effects of mechanised logging in the lowland dipterocarp forest at Lempake, East Kalimantan. Malaysian Forester, 44, 407–18. World Bank, 2001. Understanding poverty. www.worldbank.org. Ghana Statistical Service 2000. Pattern of Rural Poverty in Ghana. Accra, Ghana Statistical Service. UNDP (United Nations Development Programme. 2005. Comments on The Concept Note: Joint World Bank and IMF Report on Poverty Reduction Strategy Papers- Progress in Implementation, 2005 PRS Review. New York. Ghana Statistical Service. 2008. 2003 Core Welfare Indicators. Accra: Ghana. IMF. 2005. “Strengthening the fund's ability to assist low-income countries meet balance of payments needs arising from sudden and exogenous shocks.” Draft Washington, D.C.
	Malik, S. J. 1998. Rural poverty and land degradation: What does the available literature suggest for priority setting for the Consultative Group on International Agricultural Research? A report prepared for the Technical Advisory Committee of the Consultative Group on International Agricultural Research. Vienna, Virginia, Draft, February. Webster, Andrews 1990. Introduction to sociology of development. London: MacMillan Publishers. UNECA-SA (United Nations Economic Commission for Africa, Subregional Office for Southern Africa). 2005. Economic and Social conditions in Southern Africa 2003: The Challenge of Private Sector Development in Southern Africa. Addis Ababa, Ethiopia. Townsend, P. 1979. Poverty in the United Kingdom, a Survey of Household Resources and Standards of Living. London: Penguin Books and Allen Lane. North, P. J. 1987. People in society. England: Longman Group Ltd.
	Sancho, A. (1996). Policies and programmes for social and human development. A handbook produced for United Nations World Summit for Social Development. International Center for Economic Growth, San Francisco. Olayemi, J. K. 1995. A Survey of approaches to poverty alleviation. A paper presented at the NCEMA Workshop on Integration Poverty Alleviation Strategies into Plans and Programmes in Nigeria, Ibadan. Institute of Statistical, Social & Economic Research (ISSER). 1970. Policies and options for Ghana’s economic development. Institute of Statistical, Social & Economic Research (ISSER) University of Ghana, Legon, Ghana. Vizard, P. (2001). Poverty and human rights: Sen's 'capability perspective' explored. Oxford: Oxford University Press. Nussbaum, M. C. 2003. Capabilities as Fundamental Entitlements: Sen and Social Justice. Feminist Economics, 9 (2 & 3), 33-60. World Bank. 2007. World Bank report on Poverty. New York. Oxford University Press. Oldeman, L.R., R.T.A. Hakkeling & W.G. Sombroek. 1991. World Map of the Status of Human-Induced Soil Degradation: An Explanatory Note. ISRIC (International Soil Reference and Information Center), Wageningen, The Netherlands. (Gives a numerical overview of the importance of land degradation, classified per type of degradation and per specific phenomenon at world and individual continental level). The United Nations. 2000. The Millennium Development Goals Report 2000. New York: The United Nations. Eswaran H, Lal R, Reich PF. 2001. Land degradation: An overview. In: Bridges, EM, Hannam ID, Oldeman LR, Pening de Vries FWT, Scherr SJ, Sompatpanit S, eds. Responses to Land Degradation. Proc. 2nd. International Conference on Land Degradation and Desertification. Barrow, C. J. 1991. Land degradation, development and breakdown of terrestrial environments. Cambridge: Cambridge University Press. Wim, G., & El-Hadji, M. 2002. Causes, general extent and physical consequence of land degradation in arid, semi arid and dry subhumid areas. FAO, Rome: Forest conservation and natural resources, forest Dept. United Nations Environment Programmes 1992. World Atlas of Desertification. London: E. Arnold. Nkansah- Kyeremateng, K. 2000. Kwahu Handbook: Tips galore for investors and tourist. Bepong, Ghana: Sebewie Publishers. Agbesinyale, P. K. 1992. Agricultural Expansion and the State of Ghana’s Environment The need for Sustainable Development. Discussion Paper Series No.2, Centre for Development Studies, U.C.C. Ghana Statistical Service. 2002. The 2000 Population and Housing Census. Accra: Ghana Statistical Service. Muhammed, M.A.S. 2007. Rural Development and Enterprise Development, Alexandria: Sustainable Development Association. Opoku-Mensah, Y. 2012. An analysis of human resource planning and its effect on organisational effectiveness – a case study of information services department, Accra office. Ghana Statistical Service (GSS). 2004. Ghana living standard survey 2004. Boserup, E. 1965. The condition of agricultural growth. London: Allen and Unwin. Ewusi K. 1978. Plannning for the neglected rural poor in Ghana. Legon: I.S.S.E.R. Technical Publication. Schiller, R. B. 1973. The Economics of poverty and discrimination. New Jersey: Prentice Hill Inc., Englewood. GPRS, 2004. Ghana Poverty Reduction Strategy. Accra. Glewwe, P., & Twum-Baah, A. 1991. Distribution of welfare in Ghana 1987/1988. Living Standard Measure study working paper no.75 Washington D.C.
	Ravallion M., & Sen, B. 1994. Impacts On rural poverty of land based targeting, poverty and human resources division. World Bank. Mimeo. Bloom, L., & Ottong, J. G. 1987. Changing Africa: An introduction to sociology. London: Macmillan. Bibangambah, R. J. 1985. Approaches to the problem of rural poverty in Africa. In Kiros, F. (Ed.). Challenging Run fall Poverty. Trenton, New Jessy: Africa World Press. Chambers, R. 1983. Rural development: Putting the last first. England: Longman scientific and Technical. Dolphyne, F. A. 1991. The emancipation of women: An African Perspective Accra: Ghana, Universities Press. Khon Kaen, Thailand. Oxford Press, New Delhi, India. Obadan, M. 1997. Analytical framework for poverty reduction: Issues of Economic Growth Versus Other Strategies. Proceedings of the Nigerian Economic Society Annual Conference on Poverty Alleviation in Nigeria 1997. Ibadan: NES: 1-18. Thompson, I., Mackey, B., McNulty, S., & Mosseler, A. 2009. Forest resilience, biodiversity, and climate change: a Technical Series no. 43. Montreal, Canada, Secretariat of the Convention on Biological Diversity. Asibey, E. O. A., & Becko, C. Y. A. 1989. Forest & Food Security. In Owusu G. J. K. (Ed.). Revision of Ghana’s Forest Policy. Accra: Forestry Commission symposia series no.3. Abbiw, D. (1990). Useful plants of Ghana. England: Intermediate Technology Publications Ltd.
	Hall, J.B., & Swaine, M.D. 1981. Geobotany –distribution and ecology of vascular plants in a tropical rainforest forest vegetation in Ghana. Dr. W. Junk Publishers. The Hague pp. 382. Kotey, E. N. A., Francois, J., Owusu, J. G. K., Yeboah, R., Amanor, K. S., & Antwi, L., 1998. Falling into Place, Policy that works for forests and people series No. 4. Study undertaken under the IIED, United Kingdom, and the MLF, Ghana. Ghana Forest Service. 1998. Manual of Procedures forest resource management planning in the HFZ. Unpublished. Forest Service. Accra. Swaine, M. D., V. K. Agyeman, B. Kyereh, T. K. Orgle, J. Thompson, & E. M. Veenendaal. 1997. Ecology of forest trees in Ghana. ODA Forestry Series. University of Aberdeen, UK. Marfo, E. 2010. Chainsaw Milling in Ghana: Context, drivers and impacts. Tropenbos International, Wageningen, the Netherlands. xii + 64 pp. World Bank. 1988. Staff appraisal report: Ghana Forest Resources Management Report. No. 7295-GH. World Bank, Washington, D.C, USA. 119 pp.